Less than 24 hours after Capital boxer Josh Taylor became Commonwealth super-lightweight champion at the same venue, neither Edinburgh City nor Forfar could knock each out of the William Hill Scottish Cup as this second-round tie ended in a 0-0 draw at Meadowbank. 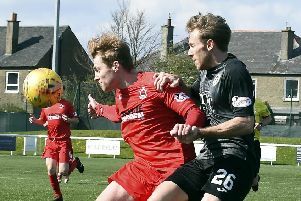 City had their opponents on the ropes at times in the second half, but couldn’t convert chances into goals, while the Angus side failed to land a late sucker punch on the break. City manager Gary Jardine was disappointed not to claim a first win of the season, but a maiden clean sheet was one positive for the city boss. He said: “There was a lot of chances in the game, but we’ve been waiting a long time for that first clean sheet,” he said. “The last one we got was in the play-off final so in that aspect it’s good to give the goalkeeper and the defence a boost. Former City man Danny Denholm almost put the Loons ahead early on. His overhit cross bounced higher than keeper Andrew Stobie was expecting, but he managed to backpedal and tip the ball away from the top corner. From a similar position, Jamie Bain’s more deliberate effort was heading for the same corner, and required a more impressive save from Stobie. An ambitious effort by Mark McConnell from his own half was intended to catch Grant Adam off his line, although it lacked the accuracy often seen from the Forfar keeper’s brother, Charlie, and sailed over. Craig Beattie spurned the best chance of a poor first 45 shortly before the break. Marc Laird’s initial shot was half blocked and fell nicely for the former Hearts man, but his close-range effort was too close to Adam, who saved with his legs. The striker almost produced a sensational opener within minutes of the restart. Laird’s pin-point pass over the top was controlled with a wonderful first touch from Beattie, but his left foot volley dipped just wide of Adam’s far post. A short header back from Ryan Porteous then gave Jim Lister the chance to break the deadlock on the hour, but Stobie stayed big to smother his effort from close range. A header of any kind at the other end from Porteous would have had Adam struggling, but the on-loan Hibs man couldn’t connect with Chris McKee’s wicked delivery. Bain thought he’d won it for the visitors in stoppage time with a stinging shot from the edge of the area, but was denied by a brilliant save from Stobie. Forfar manager Gary Bollan is preparing to see plenty of City over the next week. “We’ll be sick of seeing each other,” he joked. “We’ve got each other next Saturday and the replay the following Tuesday so there won’t be any surprises between us. We’re still in the cup and that was the main thing after today. Edinburgh City: Stobie, Caddow, Donaldson (Mbu 33), Porteous, Laird, McKee, McFarland, Gair, McConnell (Allum 81), Guthrie (Muhsin 66), Beattie. Forfar: Adam, Bain, MacKintosh, Munro, Malcolm, Fotheringham, Cox, Denholm, Lister, Swankie, Peters (Smith 69).